#6......#THE RACK" - BODIE 3.7 . you'll never walk alone ! thankyou so much , glad you like it and thankyou for looking . 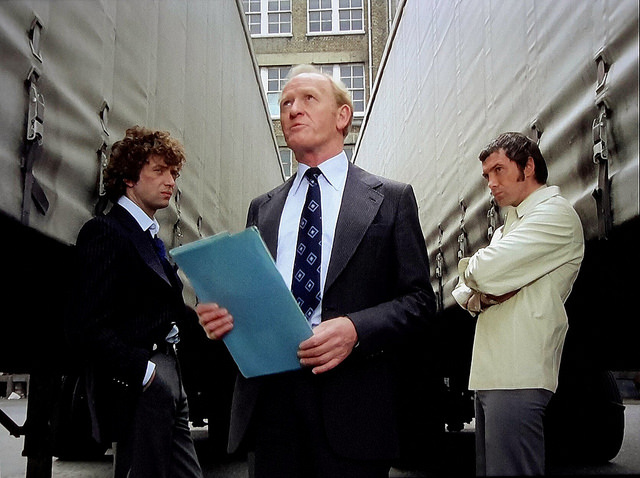 I love this scene, partly because it can be used in so many different contexts and with the three in so many different positions like the one you have here, the two of them on their own, Cowley turned towards them and chastising and Doyle walking away leaving Bodie alone. A great image showing a great scene, thank you! i love this scene also , they are so together here and both of them look ready to argue with Mr Cowley if need be but as usual they both keep silent and accept the bosses brief rant at them . Thankyou so much for looking . What a terrific pic - the claustrophobic lines hedging them in, the look on the lads faces, Cowley looking all indefatigable. thankyou so much for looking and so glad this works for you . I must admit to loving this scene , so much tension . Oh what a cracker of a shot! Classic! That's a particularly stunning Doyle image in there, as well. thankyou so much for your comment , glad you like it and glad you like your Doyle here .Many thanks for taking a look. Lovely! On of my favourite moments in the ep - the lads are so united even though they're standing so far apart. Love it, thank you. thankyou so much , yes this scene is so good , full of rension and lots of scowling and you can clearly see from their body language exactly what they are feeling . thankyou so much , Doyle is very good at leaning and Bodie seems intent to stand there with his arms folded in a very defiant position . thankyou so much , glad you like it and thankyou for stopping by to take a look . A great, iconic shot... and with lovely light. thankyou so much , glad you like it and glad you like your Doyle here . I lovelovelove this! The framing, the lines, the matching scowls and leans, and Cowley in the middle, totally in command. Brilliant! thankyou so much for loving this .They look positively seething but yet are holding in it somehow Thanks for the comment .